The Urania is a funny institution - once founded as a star observatory, it now serves as a venue for all sorts of cultural things, lecture theatres, as a bar and restaurant and - most importantly - as a puppet theatre. The latter one is what most Austrians associate the name "Urania" with: It is here that some of the country′s most popular TV puppet shows are shot and were shot for the past decades - the "Wiener Urania Puppentheater", founded by Hans Kraus. To me, several of the "Urania" puppet stars are dear memories to my early childhood. This does not apply to Petzi the Bear, whom I hated and still can′t stand. 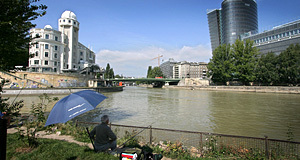 The Urania occupies a very prominent site directly at the Ringstraße. It was built in 1909 by the well-known Art Nouveau or Jugendstil architect Max Fabiani, a student of Otto Wagner. One of Otto Wagner′s most famous buildings, the Postsparkasse, can be found just around the corner of the Urania. The Urania was opened by Emperor Franz Joseph I in 1910 as a star observatory and educational institute. For decades, the Urania also ran precision clocks and offered a telephone time service. Until the launch of this service, most people in Vienna matched their clocks and watches with church bells. The Urania is named after the Greek muse of astronomy. Astronomical observations were done mostly for educational purposes, the Urania was never a significant research institution (unlike the Kuffner Sternwarte in Ottakring). Nevertheless, the Urania was equipped with very expensive astronomic instruments, including a Zeiss refractor. In 1944, the Urania was hit by a bomb and seriously damaged, the Zeiss refractor was destroyed. The so-called "lantern", the little tower with the dome on top and twelve windows at the base, had to be re-built from scratch. This was done until 1956, when the Urania was re-opened. In 1980, a new telescope was purchased and used for astronomy courses. The Urania was re-furbished between 2000 and 2003; in the course of this refurbishment, a second dome was added instead of the former Meridianhaus and the main cupola was renewed. Today, the Urania still offers the previously described mix of astronomy classes, cultural events, food and puppets. Attractions nearby are numerous - the closest one are the Kriegsministerium and the Postsparkasse, as well as the Dominikanerkirche Church and the Museum for Applied Arts. For other attractions, please see my article on the Ringstraße.